As a massage therapist, I consider myself to be pretty well versed in the art of therapeutic touch. I have worked with hundreds of clients and have been fortunate to witness a lot of beautiful healing work unfold under my hands. I have also been fortunate enough to learn about and embody therapeutic touch by means of studying and teaching yoga. When I first began to assist my teacher, Amy Ippoliti, on the road, she began to teach me not just the typical subjects of modern yoga (asana, alignment, philosophy, etc. ), but also how to approach hands on adjustments. She taught me specific moves, but she also did what yoga does so well: she placed a new way of seeing the world in front of my eye. She gave me a framework through which to approach the extraordinary work of hands-on adjustments. 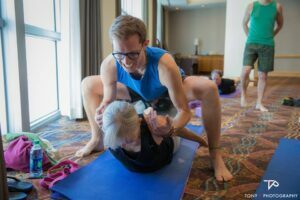 In particular, there are three guiding principles she shared that have not only served me well in adjusting students, but also in my massage work and teaching yoga and in my own life. This indicates the first stage in which you connect with the student’s energy. It’s an inquisitive process. Discern the qualities present within the student by feeling for their unique energetic pattern (do they seem shaky, confident, scared?) and then establish trust by tuning into the student’s pattern. When you are trying to implement a personal or professional change (an adjustment!) for the better, start with this first principle. Sensing is an awareness practice, so ask what patterns are present and what is the essential information you need to know? It’s also an opportunity to look for the good within the situation – how is the divine present? What is working well? Once you acknowledge the higher forces at work, then you establish trust in yourself and trust with your student. The second step is to create stability. Without stability a safe, successful adjustment isn’t possible. Whether it’s a steadying hand in a balancing pose (like ardha chandrasana) or being a wall behind a student as you help them open their chest (like in trikonasana), stability allows the practitioner to relax and move from a more powerful place. Similarly, it’s important to attend to the small instabilities first in order to be present and powerful when making a change in your life. A little “life” instability can be something like getting your bills paid, making sure you’re fed and clothed, etc. If you’re late on paying your electric bill and don’t have any power (or internet – yikes! ), how you can you focus on creating a positive life change? When your attention is divided by little things then you tend to lose sight of your larger goal. Also, these seemingly minor details have a way of later making trouble if you don’t attend to them first. However, when you take care of the little things before making any big changes, you can put all of your power and attention into creating that positive change. Adjusting means that you physically move the student’s body or body part and they “go with you” and move. It could be the movement of their thighs rooting into their hip sockets as you adjust their sacrum in downward dog, or rotating their rib cage up to the sky in rotate head to knee pose. There are so many things to say about making an actual hands-on adjustment, but within the context of these three principles, I think the most important thing is this: remember your process. That is, don’t ignore all the work you just did! You took the time to become aware of the student’s energy and needs and then took the time prepare them for the adjustment. Remember that and you can make a beautiful adjustment with confidence. In some ways, making a positive change is less of an active process than it is of letting the results of your awareness and hard work simply unfold. It requires a measure of trust in yourself and in the good work that you did so that you won’t hesitate or back down from transformation emerging from you. Remember the greater forces at work within you, take the time to get well aligned, and then observe the splendor of something new being created! About the Author: Joey Gottlieb rolled out a yoga mat for the first time depressed and nursing a blown hamstring and an inflamed shoulder, and after eight weeks of consistent practice under the eye of some wonderful teachers, he found himself with a peaceful mind, a fully cooperating hamstring, and able to reach above his head. Since those first weeks of practice, Joey has made an extensive study of yoga as a transformational, guiding practice. He has studied most intensively in the Tantric traditions of yoga, developing a style of therapeutically-minded vinyasa yoga emphasizing personal empowerment and light-heartedness. Joey is also a licensed massage therapist. As the son of two diplomats, he draws on a diverse array of cultural experiences to link his yoga practice to the world at large. 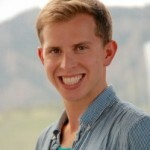 He writes for the 90 Monkeys blog and continues to assist his teacher and mentor, Amy Ippoliti, in her public workshops and teacher trainings.